While we were in Turkey studying the Seven Churches of Revelation, we spent an evening touring a large Turkish factory that made exquisite hand woven rugs. Turkish rugs are generally thought of as the finest quality rugs in the world. The intricate and laborious process used to make these rugs was fascinating to learn about. It also revealed a wonderful life lesson in the process. This factory made their rugs out of wool, cotton, and silk. However, the the silk process was by far the most costly and labor intensive. The first step in making a silk rug is to obtain the huge amount of silken thread that is required. The silk comes from the silkworm and this factory raised their own silkworms. The silkworm only eats mulberry leaves and uses that food to make a silk cocoon that contains a single thread of silk from one to three thousand feet long. It takes two to three thousand cocoons to make just one pound of silk! The single threads are entwined together to make a larger, stronger thread. Then the thread has to be died and dried for each color necessary in the pattern of the rug. It was amazing to see how much time and effort it took just to get enough silk for a single rug. 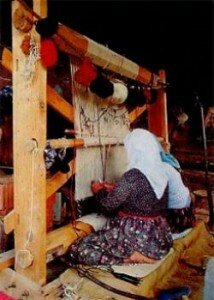 The rug itself was constructed on a loom, which was a large wooden frame standing upright with horizontal rails to push the threads down tight on the rug. The loom served as a framework for the threads that were woven in both horizontally and vertically to complete the design. The master weaver stands in front of the loom and carefully places each thread in the place for the design that he has envisioned. Each thread is carefully tied and wound into the next one in order to complete the overall pattern. Close attention is paid to every thread and every detail to make sure that every cord stays in its proper place. Weaving a silk rug can take months or even years, depending on the size and quality. The more knots and the more thread count, the more expensive the rug. No two rugs look alike; they are unique in their pattern and detail. Now consider the image of our lives as the rug being woven by the master weaver, God himself. The weaver has a design in mind, even before he starts the rug (Psalm 139:14-16). He then carefully begins the tapestry pattern, weaving in both dark threads and light, tying them all together to form the desired pattern (Lamentations 3:37-38, Job 3:10, and Romans 8:28). Each individual thread has a predetermined length and place (Psalm 90:12). Each individual thread has value as it relates to the whole pattern and no one thread is more valuable than the others. All together they make up the pattern the master weaver has planned (Psalm 139:14). The rug must be stretched and pulled and each thread beaten down to make the rug tight and secure. Many knots are used to keep the threads in place (Hebrew 5:8). Paying careful attention to every detail, the weaver pours his heart into making the rug come out exactly as he had planned (Psalm 139:17-18, 1 Peter 1:6-7). Only when the tapestry is finally completed can the full pattern in all it’s beauty be seen and appreciated (1 Peter 2:9). Many more analogies can be made comparing our lives in God’s hands to these beautiful rugs, however the following poem written by an anonymous writer seems to say it perfectly. Corrie Ten Boom often used this poem when she spoke about her life during WWII and the trials that she had been through. I cannot choose the colors, He worketh steadily. Forget He sees the upper and I, the underside. Shall God unroll the canvas and explain the reasons why.